Is water leaking from your air conditioner? Does your home takes longer to cool down? Is the air not as cool as it used to be? You may be experiencing evaporator coil issues. Don’t let frozen evaporator coils keep you hot in the summer. Call (937) 488-4758 and find out about our expert Springfield evaporator coil cleaning and repair solutions today. CJS clean, screened, trained and timely techs work quickly to cool you down. The evaporator coils are responsible for cooling the air that enters your home. When they are damaged you can quickly find yourself without cold air. To help combat this issue, our staff is here to help. 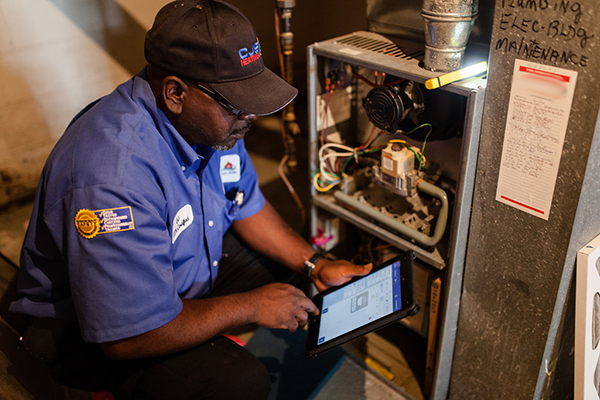 At CJS Heating & Air we have the skills and expertise needed to provide you with high quality evaporator coil cleanings, repairs, and even installations. Dirt & Dust – The evaporator coils work by being exposed to air and cooling it. When the air filter is not replaced regularly however, dust, dirt, and other debris can all make their way onto the evaporator coils. This can cause them to stop working, preventing the creation of cold air altogether. Frozen Coils – Another problem that stems from dirty coils, is frozen coils. When the freon in the coils has no way of cooling the air, it can freeze the coils. In some instances this can cause the coils to break. In others, the coils may thaw, resulting in significant water damage to your home. Age – Is your air conditioner older than 10 years? As the system ages, it can deteriorate. This is especially true for the evaporator coils. As they age, they may grow leaks, preventing the coils from operating as they should. It can also leak freon, which can be damaging to the whole system. Should these problems crop up, it’s time to get professional service from our trained experts. At CJS Heating & Air we have the skills needed to repair and clean your evaporator coils. If this doesn’t do the trick, we can also replace them as well, guaranteeing a quality solution for your cooling needs. How can timely repairs and services benefit you? In order to enjoy these benefits, it’s important to work with our repair specialists. We arrive quickly and get to work solving your evaporator coil issues. Once finished, you will enjoy cool air throughout your home, in no time. Your air conditioner, and its internal components, are all very delicate. Without the proper knowledge and training, small repairs can turn into major damage for your system. At CJS Heating & Air we have the training, experience, and skills needed to provide you with a high quality evaporator coil solution. We are available for emergency services and can help you whenever you need us most. Our mission is to provide services that are all about you. From our affordable rates, to our courteous staff, you will be 100% satisfied with all our work, guaranteed! So call us, and get reliable Springfield evaporator coil solutions for your home today. Is your air conditioner blowing hot air? Your evaporator coils may be frozen! Call (937) 488-4758 for fast and reliable services. We offer whole system cleanings and repairs to get your home cold in no time.